Nicholas: We first met when we were spending the night out with our best friends. They made an ad- hoc arrangement to meet while still with us, and we unwittingly became participants in their meet-up. We hardly spoke a word to each other as Carol, being Taiwanese, spoke mostly Mandarin while my Mandarin was not ideal. From mere acquaintances, we became closer as an unthinkable level of chemistry began to unravel, with the help of an English-Chinese dictionary app. Language was not the only barrier we faced, as her parents understandably had concerns about her being married and living overseas. As with all unions of such a nature, it took time and effort to nurture trust with her family. We made regular trips back to Taiwan to meet with her parents and occasionally, I visited Taiwan alone when our flying rosters had off days that coincided. With all that and the very fact that I hardly spoke a word of Mandarin in the past, it still befuddles my friends to see our love story unfolding like yet another episode of “Ai”. But the last seven years have been anything but tumultuous. Every waking day with Carol is filled with love and laughter, and perhaps the only similarity with that infamous Taiwanese drama is how it seems certain to be continuing for the next 700 years. Nicholas: We climbed to the very top of a medieval castle in Tossa de Mar, an old town located along the Costa Brava of Spain. Carol had not been anticipating this, as we had yet another trip to New Zealand that we were planning for the next month. This trip was a rather impromptu one, as I had swapped flights to be on hers (both of us being flight crew), to accompany her on this flight to Barcelona. Carol and I have always had an innate attraction to the sea, and it was with some good fortune that there was a quiet little spot that overlooked the Balearic Sea where I found the opportunity to pop the question. I had tied the ring to a toy-figurine that belonged to Carol, which was in turn hidden in a dim-sum box. It was an unconventional proposal but none too different from the way our relationship has always been. Carol: Prior to visiting Alisha & Lace, we had been to quite a few studios but none had made much of an impression. 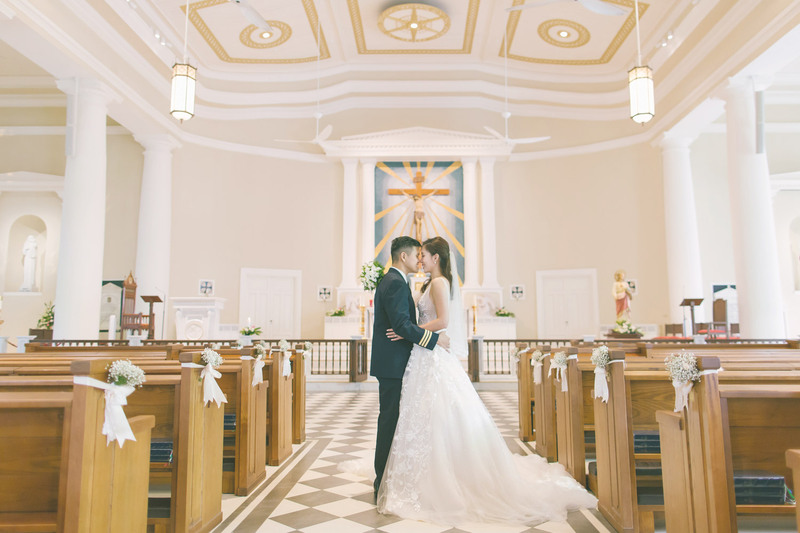 We were planning to have our church wedding on the first day, followed by a lunch banquet on the second, where we had planned to mingle with our guests. We did not plan to have a march-in. 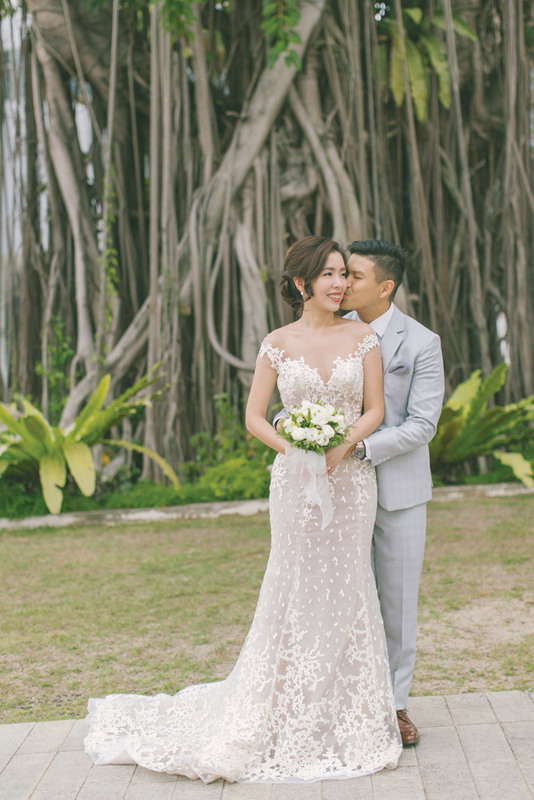 Thus, I had no need for an evening gown, but perhaps just two wedding gowns that would also fit in nicely with the photography at the different venues. Our needs were different from the packages offered by most of these studios, and Alisha & Lace was very accommodating in this respect. It did not take long for me to find the first gown and I loved this dress the moment I saw it. Without being over-embellished, its flattering neckline and sweeping train expressed a classic form of elegance and simplicity. It certainly helped in turning heads during my bridal march-in at the church. The dress that I wore at the wedding banquet almost outdid its counterpart from the previous day. Both dresses carried the hallmark of an Alisha & Lace dress – expressing a refined form of sensuality through its use of lace. The second gown was draped on ethereally, with a floral motif that caressed my shoulders. From many pictures, it almost looked like the lower layer of lace was invisible. As the venue for our lunch banquet was brimming with natural light, we adopted a colour scheme that exuded tranquillity. The dresses tied in nicely with their off-white colour that matched my skin tone. 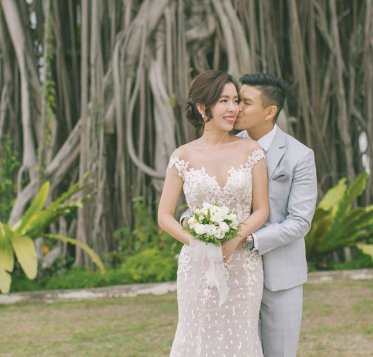 Carol: I have always dreamt of holding an outdoor wedding with a rustic garden theme, but it would not be ideal in Singaporean heat. After a long and exhaustive search, we finally got our wedding venue. Nestled just at the entrance of the National Museum of Singapore, Flutes offered a fresh breath of air as compared to the hotel ballrooms we visited. 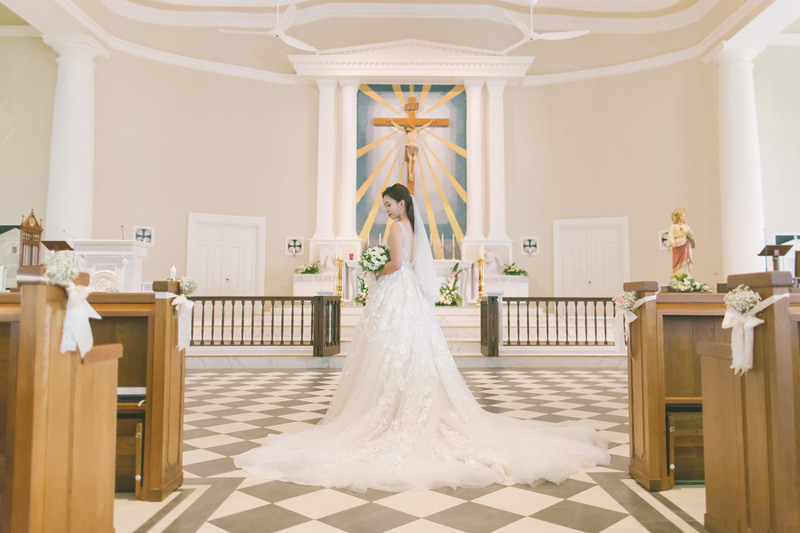 Though nowhere near the size of a ballroom, its expansive windows let in vast amounts of sunlight and this provided a stunning sensation of space. Our guests loved the cosiness and were comfortable with moving around to mingle. The lush surroundings of the National Museum also made us feel at home. The abundance of greenery allowed us the flexibility of additional photo opportunities just outside the restaurant. We sneaked in a few more shots just before the tea ceremony, which was held at the outdoor verandah of Flutes. When it came to the culinary aspect, there was little persuasion that needed to be done. Nicholas and I had been to Flutes numerous times after we had first discovered it, bearing testament to just how much we loved the food. The service was flawless as the staff paid attention to detail, the guests and presentation. By the end of the reception, we started to receive compliments for a wedding that was cosy and emotional. 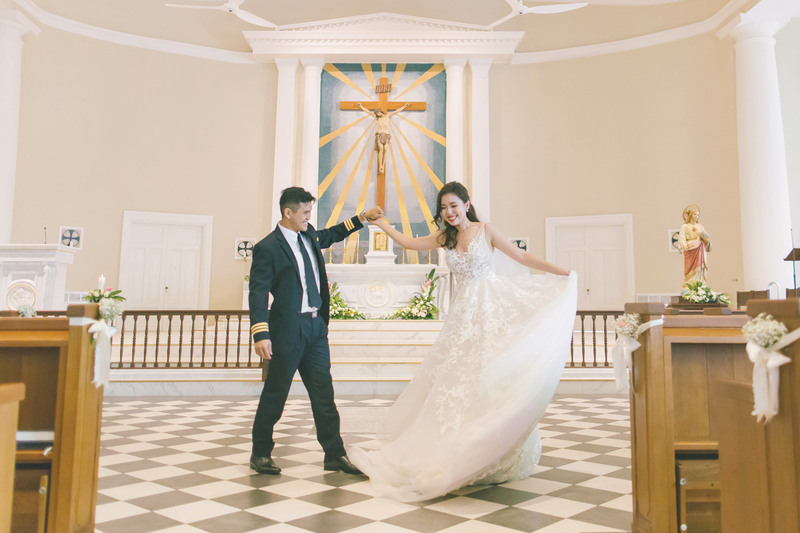 Our guests, including the older relatives, appreciated the atypical wedding that allowed them the opportunity to catch up with old friends and to connect with us, the newlyweds. Carol: The wedding service was held at the Cathedral of the Good Shepherd. It was not an unfamiliar place to us, neither was the priest who celebrated the service for us. Walking down the aisle, I could see that Nicholas was smiling and laughing with his best man, which was once again nothing surprising, or nothing that could have alluded to his sudden change of emotions. It was barely after I had taken my place beside him in front of the altar, that I realised to my utter amazement that Nicholas was trembling as he held my hand, with his eyes welling up. We have always been a playful pair, taking delight in teasing each other – so I had to control myself from laughing when I saw his lips quivering. It was this moment, in the holy presence of God, that I realised that he was going to be my husband, someone who was going to be taking care of me for the rest of our lives.